Microsoft solutions range from server infrastructure to enterprise applications and desktop productivity. Oracle offers solutions at the layers of Database, Middleware, Applications and Servers. Red Hat is the leader in enterprise Linux and is the most recognized open source brand in the world. VMware, the global leader in cloud infrastructure, delivers customer-proven virtualization solutions. Cisco networking solutions are founded on business, education, government and home contexts. Desktop virtualization, application virtualization, server virtualization, application networking. NetApp® creates innovative storage and data management solutions that boost IT efficiency. A Collaboration Suite that is a truly modern, innovative messaging and collaboration application. Barracuda Networks, Inc. offers industry-leading solutions designed to solve mainstream IT problems. GFI Software provides powerful and cost-effective email and network monitoring solutions. RSA is a provider of security solutions for business acceleration and security activities. ESET is as a pioneer of antivirus protection, creating award-winning threat detection software. Check Point is the largest network cyber security vendor globally, providing industry-leading solutions. Business processes change, company strategies change, business needs change... technologies change. Our passionate team of programmers and analysts will help you out with your development needs. A website is the cheapest and fastest way of promoting your organization. We can help our clients towards establishing a presence in the mobile application market. Improve your online presence by implementing the right Internet marketing strategy for your company. We offer a variety of Maintenance Services for onsite, telephone and email technical support. Integration Services help our customers to align different technologies with their business processes. A successful project delivered on time, in the expected quality and within the specified budget. Maintain your website yourselves from anywhere in the world provided Internet access is available. The amount of trade conducted electronically has grown amazingly since the spread of the Internet. Increase sales, marketing performance and maximizing customer satisfaction and loyalty. The concept of e-ticketing is rising along with the growing technology and the fast moving world. A web based Membership Management System designed to meet all types of requirements. Zimbra Collaboration Suite (ZCS) is a truly modern, innovative messaging and collaboration application. 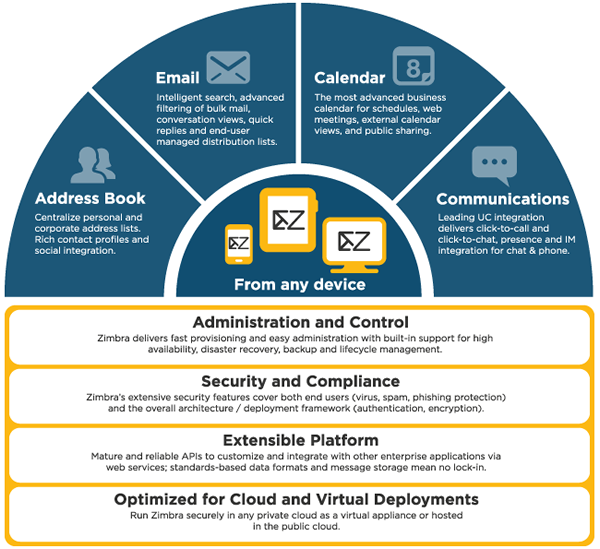 Zimbra is the leading open source solution for enterprise, service provider, education, and government environments; offering administrators and their end-users unmatched benefits. ZEBRA Consultants is a partner of Zimbra, offering implementation and support services for ZCS. Ajax based web collaboration is at the heart of ZCS. The powerful web client integrates email, contacts, shared calendar, VoIP, and online document authoring into a rich browser-based interface. Also, our unique open source Zimlet technology makes it easy for you to include custom 'mash-ups' in the ZCS web client. ZCS also includes an elegant Ajax based Admin Interface plus full scripting tools to manage the ZCS server. Full support is provided for standards-based APIs (IMAP / POP / iCal / CalDAV) as well as MAPI and iSync, which enable seamless compatibility with other clients like Microsoft Outlook, Apple desktop suite, and Mozilla Thunderbird. Zimbra also offers Zimbra Mobile, which provides over-the-air "push" synchronization to smartphones as well as a Connector for BlackBerry Enterprise Server. The Zimbra solution also has a complete high security package including built-in anti-spam and anti-virus scanning. Now Zimbra also features Archiving and Discovery, an optional component to save and search email for various compliance issues. Further information on Zimbra solutions can be found on Zimbra website at www.zimbra.com. For any clarifications please feel free to contact us at +357 22028128 or send us an email at zimbra@zebrac.com.